The RF40V multiband, multirole VHF/UHF vehicular radio is designed for communication on the tactical level in all military branches. 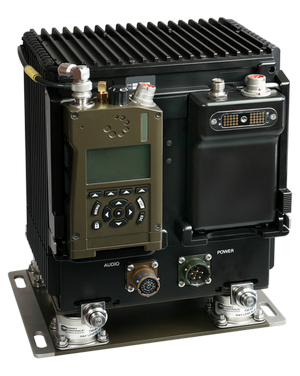 The RF40V is intended for installation in all tracked and wheeled vehicles and base stations. The core component of the RF40V is the RF40 handheld radio. To maintain communications in dismount operations, the system’s “jerk-and-run” capability allows the handheld radio to be quickly removed. FM/AM - voice modes according to STANAG 4204/4205 support legacy ground-to-ground and ground-to-air communication. WF40 - full fledged COMSEC-secured MANET-type network for voice and data communication in VHF and UHF with automatic rebroadcasting capability over several hops in only 250 kHz wide radio channel offering up to 270 kbit/s capacity for data. HW20 - frequency agile VHF waveform secured by strong COMSEC/TRANSEC allowing backward compatibility with AT RF20 radio system. This modern software defined radio platform is open for further legacy and custom waveform porting.